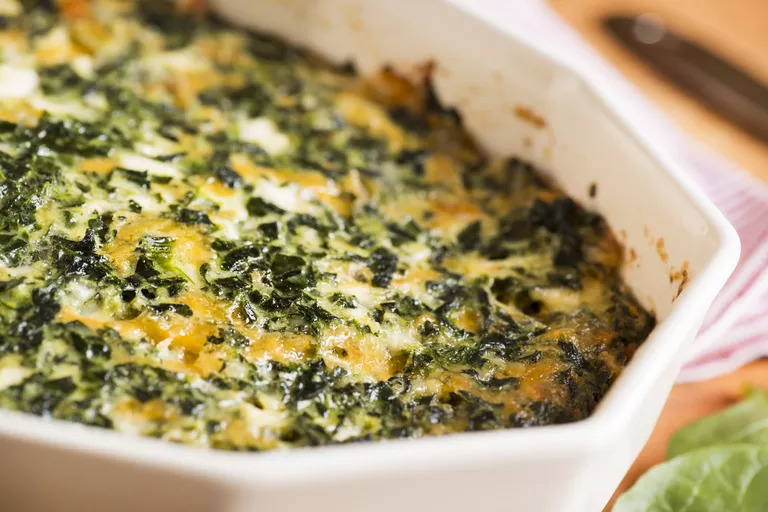 This spinach casserole is easy to make and cheesy, yet light. This recipe can replace your traditional spinach dip appetizer. Using cottage cheese and feta instead of cream cheese and cheddar cheese in this recipe saves fat and calories, but gives a similar taste and texture. Bake this in the oven, or use a slow cooker to make ahead. Enjoy as an entree, appetizer or snack. 2. Defrost spinach in the boxes or in a 2-quart casserole dish. 3. Fry chopped onions in oil until they are translucent and begin to soften. 4. Mix all ingredients except for the Parmesan cheese in the casserole dish. Sprinkle Parmesan on top. 5. Bake for 40-45 minutes or until knife inserted in the center comes out clean and cheese on top begins to brown. Let stand for 10 minutes. Serve warm with crudites or chips of your choice. This recipe is easy to adapt, so if you have certain spice mixtures or salad dressing seasonings that you like, feel free to add them. For example, you can add ½ teaspoon of Chinese Five Spice Powder or another spice mix to give the spinach casserole some depth. It’s not unusual to add dried ranch dressing mix or dried vegetable soup mix to the recipe to give your spinach casserole a distinct flavor. Speaking of spice, you can make this spinach dip spicy too. Add some kick to this spinach dish by adding jalapeno peppers, red pepper flakes or cayenne pepper. Simply add these when preparing the onion. Spinach is full of iron, folate, and fiber, but who says you can’t add more. Add shredded artichoke hearts, broccoli, carrots or zucchini to boost the nutritional value of the dish. Instead of crackers, corn chips, or bread, serve with cucumbers, jicama, cauliflower florets or bell pepper strips. Kale can be substituted for spinach if you want to try different greens with this recipe. Another excellent addition is fresh garlic for extra flavor. A cup of cooked quinoa or chopped chicken breast can also be added to this recipe to boost protein, although the Greek yogurt addition in this recipe provides plenty of it.